Hanoi (VNA) – The Vietnamese Government, Foreign Ministry, relevant agencies, and Vietnam Bar Federation have implemented citizen protection measures to protect the legitimate rights and interests of Vietnamese national Doan Thi Huong in her trial in Malaysia, the spokesperson of the Foreign Ministry Le Thi Thu Hang said. She made the statement on April 1 in response to reporters’ queries about Vietnam’s reaction to the Malaysian court’s ruling for Huong at a trial on April 1 on the case related to the death of a man holding a Democratic People’s Republic of Korea (DPRK) passport with the name of Kim Chol. The spokesperson affirmed that immediately after the incident occurred, the country has taken all necessary measures to ensure the citizen was given a fair trial and an early release. 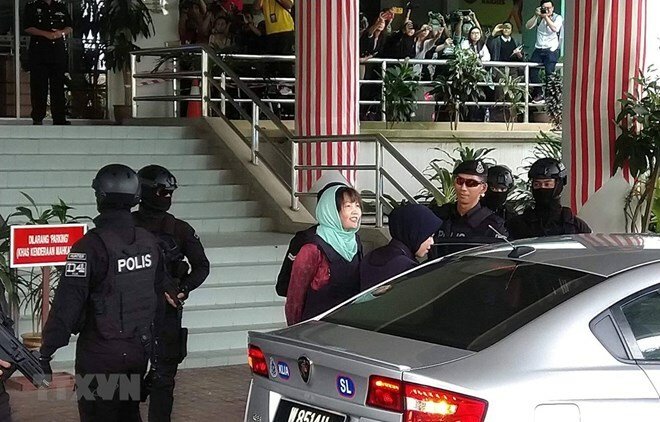 The Malaysia’s Shah Alam High Court (MLS) on April 1 sentenced Doan Thi Huong to three years and four months imprisonment on the charge of causing injuries using dangerous means, instead of the initial charge of murder. The penalty is calculated starting from the time Doan Thi Huong was arrested on February 15, 2017. At the end of the trial, Doan Thi Huong and her father Doan Van Thanh had a quick exchange with the press, expressing thanks to the Vietnamese Government and relevant agencies as well as lawyers for making effort to protect Huong’s rights.